Those of you that have read my previous questions know about my work at understanding and implementing quicksort and quickselect, as well as some other basic algorithms. Quickselect is used to calculate the kth smallest element in an unsorted list, and this concept can also be used to find the median in an unsorted list. This time, I need aid in devising an efficient technique to calculate the running median, because quickselect isn't a good choice as it needs to re-calculate every time the list changes. Because quickselect has to restart everytime, it can't take advantage of previous calculations done, so I'm looking for a different algorithm that's similar (possibly) but is more efficient in the area of running medians. The streaming median is computed using two heaps. All the numbers less than or equal to the current median are in the left heap, which is arranged so that the maximum number is at the root of the heap. All the numbers greater than or equal to the current median are in the right heap, which is arranged so that the minimum number is at the root of the heap. Note that numbers equal to the current median can be in either heap. The count of numbers in the two heaps never differs by more than 1. When the process begins the two heaps are initially empty. The first number in the input sequence is added to one of the heaps, it doesn’t matter which, and returned as the first streaming median. The second number in the input sequence is then added to the other heap, if the root of the right heap is less than the root of the left heap the two heaps are swapped, and the average of the two numbers is returned as the second streaming median. Then the main algorithm begins. Each subsequent number in the input sequence is compared to the current median, and added to the left heap if it is less than the current median or to the right heap if it is greater than the current median; if the input number is equal to the current median, it is added to whichever heap has the smaller count, or to either heap arbitrarily if they have the same count. If that causes the counts of the two heaps to differ by more than 1, the root of the larger heap is removed and inserted in the smaller heap. Then the current median is computed as the root of the larger heap, if they differ in count, or the average of the roots of the two heaps, if they are the same size. Code in Scheme and Python is available at my blog. The Jeff McClintock running median estimate. Requires keeping only two values. This example iterates over an array of sampled values (CPU consumption). Seems to converge relatively quickly (about 100 samples) to an estimate of the median. The idea is at each iteration the median inches toward the input signal at a constant rate. The rate depends on what magnitude you estimate the median to be. I use the average as an estimate of the magnitude of the median, to determines the size of each increment of the median. If you need your median accurate to about 1%, use a step-size of 0.01 * the average. 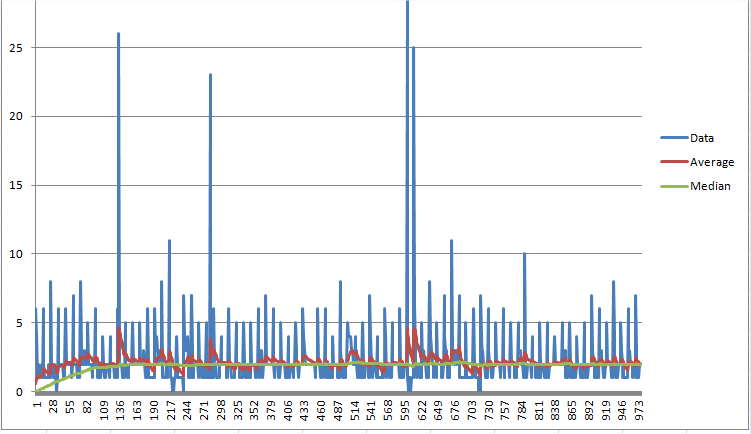 average += ( sample - average ) * 0.1f; // rough running average. One solution would be to maintain an order statistic tree, inserting each element of the sequence in turn, then compute the median of the elements in the tree. This would take O(lg n) time per insertion and O(lg n) time per median, for a total of O(n lg n) time, plus O(n) space. Here is a C++ balanced tree structure that provides the ability to query by index in the sorted list. Since it maintains all values in sorted order, this is not be quite as efficient as the two-heaps approach, but it offers some additional flexibility. For example, it could also give you a running quartile. median is a sorted array where you take from it the middle value. simple rolling implementation is with a queue(dqueue) and a sorted_array (any implementation, binary tree, skiparray). d_queue is an array where you can push to tail and shift (pop) from the front of the array. sorted_array is an array where you insert by order at position found using binary search. I used a queue (first-in-first-out array) to track order of added values to know which items to remove from the median array, when they the queue is longer than the wanted size. to fall off elements by date time or some running index, it is possible to add another queue and check the first element is too old, and decide if to remove first value from both queues. To calculate a median efficiently I use a sorted array technique. it is when you insert new items into its sorted place, so the array is always sorted. and push a value into a queue. and binary search for it in the sorted array and remove it. Use the value(s) in the middle of the sorted_array. If sorted_array length is even use the item in the middle. If sorted_array length is odd use an average of two items in the middle. Not the answer you're looking for? Browse other questions tagged c++ algorithm median or ask your own question.